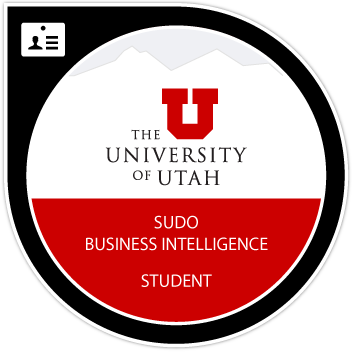 Badge earners have successfully participated in the selective U of U Student University Development Opportunity (sUdo) program. They have demonstrated the ability to exceed performance standards. They are able to provide professional service to customers and have demonstrated proficiency in responding to business intelligence related service tickets. Earners can evaluate customer issues, present solutions, and apply time management skills to accomplish team goals. Hold a mentored position within the Student University Development Opportunity (sUdo) program for at least one semester working a up to 20 hours a week. Receive "met expectations" performance reviews for teamwork and technical expertise from their mentor.